There is rising evidence that the patterns of the past forty years about investments gains may not apply in the next twenty years. The best an investor can do is to examine current trends and then conclude weather new hints about the coming changes are strong enough to take different directions. To start looking for clues about the future we begin with an examination of the long-term trends of the Gross National Product (GNP). Is something unusual taking place? 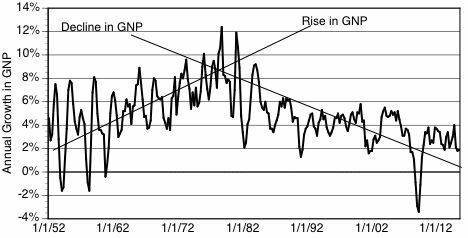 The GNP has grown steadily since 1947 with hardly any slowdowns. However, something abnormal has occurred recently. According to the Federal Reserve Bank there has been a break in the linear trend in the real GNP per capita in 2007. The real (e.g. deflated) income per capita rose steadily from $17,582 in October of 1960 to $50,172 in October of 2007. Real personal income of the U.S. population gained 285% in a period of 47 years. There was consistent rise of 6.3% per year, which attested to a rising prosperity. In 2008 the GDP plunged by an unprecedented amount of $0.5 trillion. Previously the GDP had been gaining about $0.5 trillion/year. Consequently, national income was permanently set back by $1 trillion in a single event before it would continue growing on its prior trend line. The 2008 plunge created a permanent loss that has not been recovered as yet. If the current trends continue it is unlikely that the GDP will ever recover its one trillion-dollar growth. As we shall see this loss has inflicted damages to employment, to savings and to the debt held by the society.